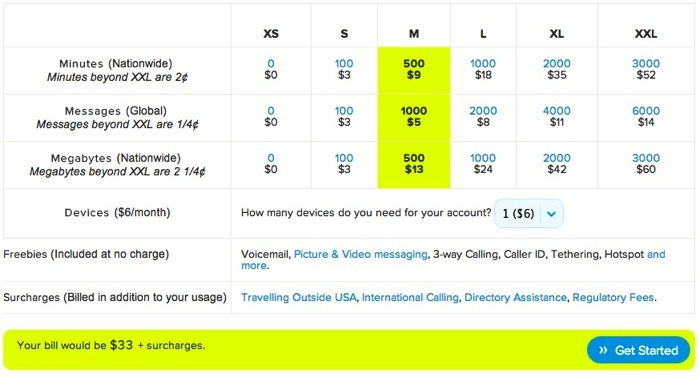 Ting is a wireless provider in the US which currently offers a unique set of mix and match plans many customers have gushed about, since many “save significantly” according to company CEO Elliot Noss, to the CBC. The company is a division of Toronto-based Tucows (remember them?). The company doesn’t have contracts and only operates on month to month plans which has proved to be popular. What’s interesting about Ting is it doesn’t have its own wireless infrastructure–it purchases network from Sprint at wholesale to resell to its customers. However, this is set to change as Ottawa’s revised wireless policies will force Rogers, TELUS and Bell sell access to their network to a new national carrier, which at this point looks to be Verizon Wireless. Below is a breakdown of Ting’s mix and match wireless plans. All plans include voicemail, caller ID, call waiting, tethering and no activation fees, plus voice roaming on Verizon as well. Have you used Ting in the US before?